Bobby George is recognised as The King of Darts. Bobby is one of the most colourful and charismatic darts player of all time. He is the biggest personality in darts and after co-presenting the famous World Darts Championships for BBC TV since 1999, followed by the Winmau World Masters (also on BBC) he is now known as ‘the face of televised darts’. Famed for his extravagant stage entrances to the sound of Queen’s ‘We Are The Champions’ dressed in a sequined cape and carrying a lighted candelabra, Bobby George has become a living darts legend. 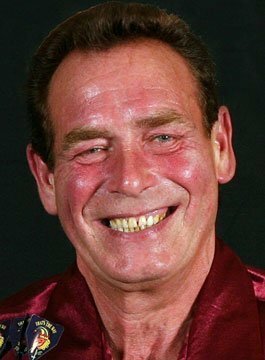 Twice winner of the famous News Of The World Darts Championship (1979 and 1986), the Butlin’s Grand Masters Champion of 1979, The 1978 North American Open, Bobby George has competed in 15 World Championships and twice been a finalist. He has more trophies, awards, honours and accolades than practically any player in the sport. He has appeared in top-rating TV shows like ‘They Think It’s All Over‘, ‘You Bet!‘, ‘Bullseye‘ and ‘Rise‘ and has also made films and videos – notably the gangster film ‘One Man and his Dog‘ in which he plays the villainous Tony ‘The Butcher’ Barton and ‘The Story Of Darts‘, on which he is the presenter from his own home – the magnificent George Hall. He has also featured in TV commercials – notably delivering the catchphrase ‘You Know The Big Dollop’s Right‘ in several TV campaigns for Hellmanns Mayonnaise and more recently on ITV1’s Celebrity Fit Club and Gone to Pot: American Road Trip. Bobby George has been featured in ‘Gillette World Of Sport’ (seen by an audience of 100 million worldwide) and it’s hardly surprising that he is universally acknowledged as ‘The King Of Darts’. He’s an entertainer, raconteur and world-class darts player with a worldwide reputation and identity. One of the most successful England Internationals of all time, he has been a star columnist for Darts World Magazine since 1994. He writes his own humorous, frank and often outspoken column in every issue. His autobiography, ‘Bobby Dazzler’, was published in 2006. Bobby has become a cult figure with a whole new generation of darts fans through his TV persona and his huge popularity as an entertainer in his now famous darts exhibitions. Married to Marie, Bobby George has two sons Robert and Richard, and they all live in the magnificent George Hall, the 18-bedroom mansion, which he built himself.